This is a guest post written by Kayleigh Alexandra. Want to contribute? Check out the 2018 publishing calendar. Content is absolutely vital to your coaching business. It’s what makes the case for your coaching services and lets your clients know that you are both well-informed and tuned-in with their needs. While there’s no doubt you’re already producing high-caliber content, there’s always room for improvement and there are plenty of tips and tricks to do this in next to no time. 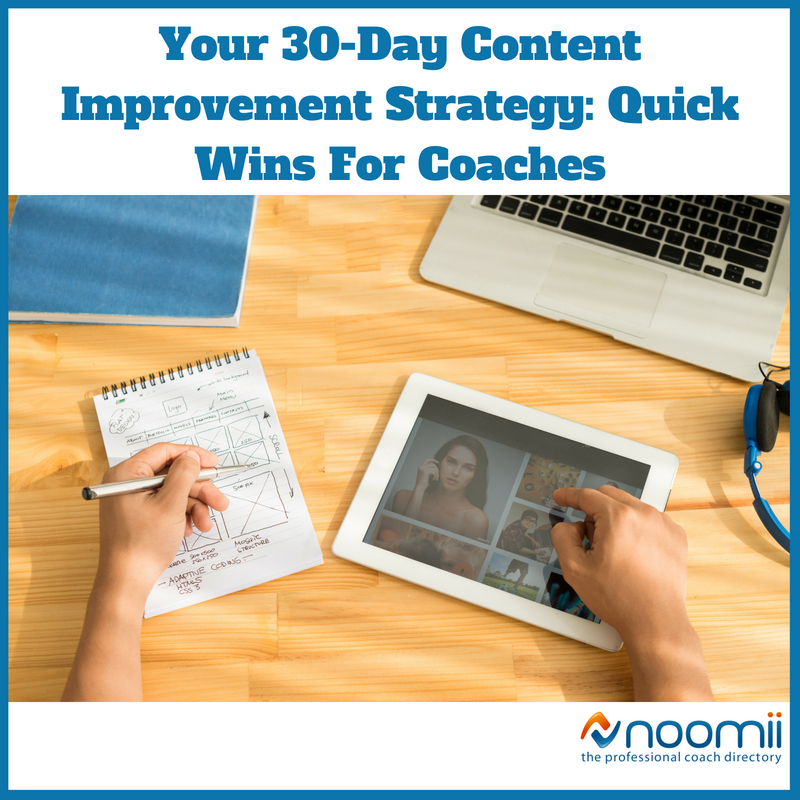 That’s why I’ve outlined a 30-day strategy that will add another layer of gloss to your content and help bring greater success to your coaching business. The first steps of your improvement strategy involve reviewing your existing data and getting back to researching your coaching niche. This is because it’s very easy to let our content strategies drift over time, forget to review hard data for insights and get out of touch with the latest and greatest our industry has to offer. Go back to your old plans — see if the message remains true and establish whether your current content reflects your original mission. Review everything from your content plans and keyword research, to your CMS and the way your site is built. Look into a year’s worth of web, email & social analytics — pick the top 10 best performing pieces and try to see what you can learn. Did some campaigns really bomb? Put yourself back in the classroom — use every possible avenue of data that you have at your disposal to make sure the content on your coaching website is up to date. Read research papers, articles, academic journals, Google news and any other valuable sources of information. Create new strategic documents — after leaving the classroom, pass your own coaching exams by filling any gaps you have in your content with new strategic documents. The key thing to remember when self-imposing your quality control on your content during days 1-5, is that your content has to tow the line between being informative and engaging. Once you’ve nailed this you can move on to the next stage. You’ve brought your content up-to-speed with your industry standards and through the process, learned more about what didn’t work and what did — but that’s not the end of your research. Next, you need to take a dive deep into the understanding of your audience aka your ideal clients. This will allow you to develop content that matches your coaching style and expectations, creating coaching literature that looks, sounds and feels like your own voice and brand. But don’t stop there because you also need to have compelling testimonials and case studies from your clients. Why? Because this content is the validation for the success of your methods. If you don't already have one, you want to develop a strategy for collecting testimonials from former and current clients. If you can get them to provide feedback in the form of a video, that is also a huge bonus. Now that you have your raw material and your tried-and-tested content, it’s time to heed your own advice and step out of your comfort zone and produce something completely new. Write your email newsletter in a new style — with a tweaked voice, or different content format. Go live — Facebook Live remains an extremely popular interactive tool and it’s one that you can utilize for your content. That’s not the only way to go live, though. Find the best format for you and your audience and then run with it. Use a freelance writer/copywriter – letting someone else tell the story of your content might add it a fresh flavor that does wonders for your engagement. Trying something different is a great way for you to test the waters on an idea that’s been on your mind for a while or a new one you’ve thought of during your research days. So give it a shot! On days 13-20 you need to focus on the deliverables in your content. How do you do this? By starting, keeping and worshipping the habits of consistency and tracking. Use your social media accounts as a litmus test for publishing consistent content — set yourself an achievable content upload target and then stick to it. To schedule mutliple posts/tweets, you may consider using a service like Hootsuite. Also, see whether you are able to implement real change in your engagement levels just by being ‘present’ and letting your followers know that you are there. This is even more important than publishing content during your ‘meaty’ period. You may also want to consider investing in automation and syndication software to help with your promotion efforts. This is about finding those good long-term habits and tools that will support you during busy periods. The data you’ve collected — what content had good engagement levels and what didn’t? An editorial calendar — knowing in advance what you’re going to be writing about gives you a chance to make the most of your time. Any ideas you’ve thought of — get them down while their fresh and then develop them! Are there channels and profits you’re working on that aren’t profitable? If so, drop them. The content management system on most web builders should be easy – and to be honest, you shouldn't expect any less. Are your expectations being met? As a coach, your livelihood is built on your ability to be engaging and informative. Having a content strategy that works to these principles is essential and investing the time into getting your content in line will pay you dividends. So, follow my tips and in 30 days your content strategy won’t need any coaching at all. Kayleigh Alexandra is a content writer for Micro Startups — a site dedicated to spreading the word about startups and small businesses of all shapes and sizes. Visit the blog for the latest marketing insights from top experts and inspiring entrepreneurial stories. Follow us on Twitter.